I’ve been looking at short haircuts on Pinterest for months. That’s how I do things. I agonize over decisions, whether it’s a haircut or a weekend road trip. A bad vacation you can edit: “The hotel was really close to all the sights [and was right above the biker bar]. A short haircut can go from classy to wild with one swoop of the hand and a little gel. As a runner and CrossFitter, my hair was usually in a ponytail or some variation thereof. I wanted a new look. Some ‘oomph’ to my hair. One morning, I found it. A very simple picture of one side of a woman’s head, her hair cropped short. I downloaded the picture for future reference. Because someday, I would cut my hair short. But then later, I was out running errands, and I realized I had some time free, which is kind of a rare thing for me. I could, conceivably, stop at a place downtown and see if they could chop off my hair. Myself, mostly, and worrying about what other people would think. It was a risk. That’s the thing with risks–you need to take them once in a while. Sure, you can’t plunge blindly into something, but you CAN plunge. In fact, you should take risks sometimes, because without them, your spirit flatlines. So, with my Pinterest photo on my phone, I walked into a hair salon. The girl with the half silver, half black hair escorted me to a chair, and strangely, I felt I was in good hands. Because a person with half silver and half black hair wouldn’t give me the traditional Franconian, old-lady hairstyle #3 (they MUST have a book of Franconian approved hairstyles somewhere). She asked a couple questions, stretching out strands of my hair. “Kurzer,” I answered a couple times. And then she went to work. It’s the best haircut I ever had. I nearly hugged the girl. I deliberately did not publicize it on facebook right away, because I wanted to have the experience of walking into the box and seeing people react (whether for good or bad). Not that I cared, really, if people liked it. But the point is that I loved it. And I did it for myself, without worrying about how other people would see me. Maybe the confidence from the haircut translated into the way I carried myself, but the reaction has been more than I expected. I’ve heard that I look younger and that I ‘rock’ the hairstyle; and I’m learning new German adjectives, like geil. I didn’t lose anything with the haircut. But I gained something intangible. Something that never tangles or needs conditioner. For men, a haircut probably isn’t very significant. But a woman’s identity can be wrapped up and braided on top of her head. And while I did love my long hair, this Pixie feels pretty damn good. 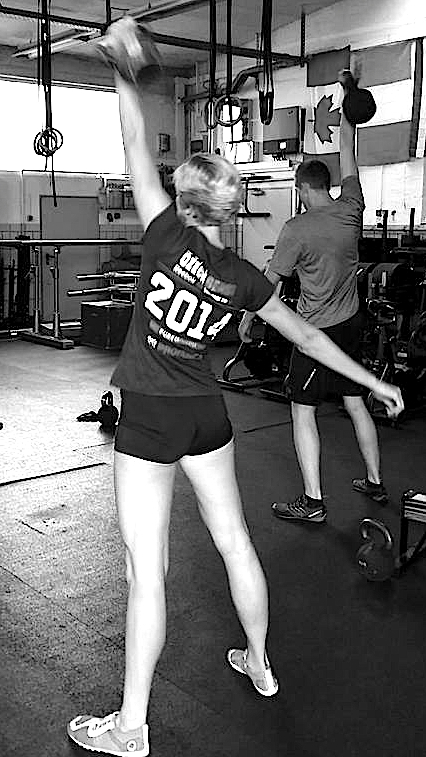 This entry was posted on Tuesday, September 2nd, 2014 at 6:18 am	and tagged with box, Crossfit, Franconia, Germany, haircut, healthy-living, pixie, short hair, training, WOD and posted in Crossfit, Life. You can follow any responses to this entry through the RSS 2.0 feed.